Sundowns closing in on Wits - SABC News - Breaking news, special reports, world, business, sport coverage of all South African current events. Africa's news leader. Mamelodi Sundowns beat Black Leopards 3-0 and moved 3 points nehind Bitwest Wits. 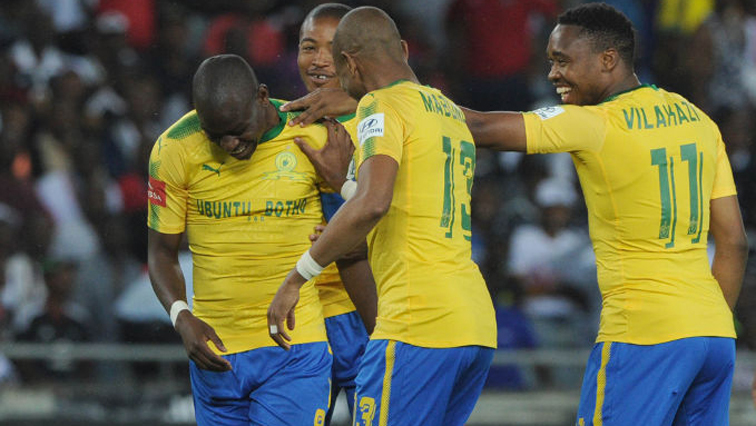 Mamelodi Sundowns have moved into second place on the ABSA Premiership log after thrashing Black Leopards 3-0 at the Loftus Versfeld in Pretoria on Wednesday night. They are just three points behind log leaders, Bidvest Wits with two games in hand. Sundowns have 34 points from 17 matches, while Wits are on 37 points after 19 outings. Sundowns came into the match looking to close the gap between themselves and the log leaders and they were determined to leap-frog Orlando Pirates into second place on the standings. Before the match against Leopards, they had three games in hand and were six points behind the Clever Boys. After missing a number of chances, the Brazilians finally got their break-through with Lebohang Maboe’s fifth goal of the season. Lidoda Duvha succumbed to Sundowns’ pressure early in the second half, with Isaac Masia scoring an own-goal. With the pressure they kept on piling, a third goal for the Pitso Mosimane-led troops was imminent. Leopards conceded a penalty and Ricardo Nascimento calmly made it 3-NIL to the defending champions. Mosimane says that players must show quality with every game. Leopards coach Dylan Kerr says that his team at times makes poor decisions during games. There’s another ABSA Premiership match Friday evening when bottom of the log Maritzburg United host Polokwane City. This entry was posted on 07 Feb 2019,08:54PM at 8:54 PM and is filed under Sport. You can follow any responses to this entry through the RSS 2.0 feed. Both comments and pings are currently closed.